Fukuoka City Yacht Harbor in big Hakata Bay is a calm and scenic marina only for sailing boats. It is large enough to moor 180 sailing boats on the water and is said to be the largest in western Japan. But, it looks smaller than Huis Ten Bosch in Nagasaki Prefecture. It takes just 8 minutes from the harbor bus stop to a subway station. The subway takes you to downtown Tenjin and Hakata Stations and to Fukuoka Airport directly just in 20 minutes. As I sailed from Karatsu to Hakata, I approached through the west of Nokono-shima Island after entering into Hakata Bay. I didn’t see any fishing net at that time. Once arrived at 33 35.900N　130 18.200E, I saw the entrance of the harbor right in front of me. Just after the entrance of the harbor, there are three long visitor pontoons which is long enough to moor a couple of 40ft boats. Mooring your boat temporary at open space there, you go to the office in front of you to check in. As the visitor pontoons are close to the entrance of the harbor, the west wind makes waves and your boat rolled. If you stay there when winds and waves are strong, you’d better to ask them to move to an open space at non-visitors pontoons. If you have to moor at a visitor pontoon, the innermost pontoon is calmest. Note. You can’t moor at either side of the pontoons. Only the seaside is available. You can’t moor at the landsides because of bulged blocks of pillars. Water is not free nor available at pontoons. You have to haul a long water hose to your boat. Instead, I carried water with portable tanks from the washing place. To my surprise, there is no power service facility in the harbor. There are many restaurants in 10 minutes walk distance. Restaurants of Udon noodles and new Champon noodles were good with reasonable prices. A big food supermarket is newly built nearby. There are also a big DIY shop, an interior shop and a big 100 yen shop. It is very convenient. There is a shower service for JPY 100. Toilet which is douche-equipped is inside the building. They said it is closed at night though, students were opening the door even at night. No fuel service. Call a gas stand for delivery services. 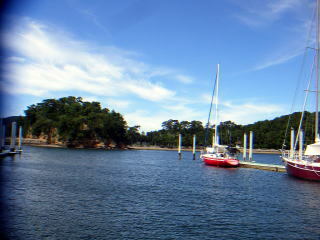 There is another marina near the harbor. I was wondering which one was good for my one-week mooring. Then, after mooring at the harbor, I went and saw another marina, Nishi Fukuoka Marina “Marinoa”. It had water and power services; and many restaurants and shops. But, as it was surrounded by concrete walls, it had no good view. My recommendation is Fukuoka City Yacht Harbor. Odo: The harbor is sometimes called as “Odo” Yacht Harbor because of its address. Hakata: Hakata is now a ward of Fukuoka City in Fukuoka Prefecture. But, as Hakata has a long history as a big port, its name is used for broader areas such as Hakata Bay. 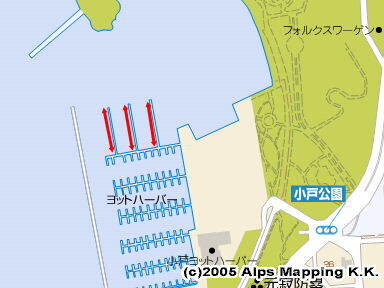 Nishi Fukuoka Marina Marinoa has English web site, which also shows the facility layout well.